The formulation has been carefully developed in the laboratory and optimised with advanced analytics to be composed only of high-purity raw materials. This ensures that ATI Essentials is a first class and safe product for the care of your coral reef aquarium. With the balanced formulation of ATI Essentials, partial water changes to correct water chemistry or compensate for trace elements are no longer completely necessary, thus stability of all essential elements can be achieved. The benefits of this will be visible in the health and growth of the corals. 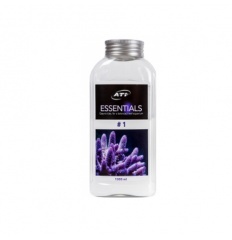 So you will have more time to enjoy your aquarium whilst using the ATI Essentials. Check out ATI's 6 pump dosing system to be able dose additives like the Essential Elements or Elements!